On a warm summer night in 1951, Ethel Shirola and Evelyn Ellis served a family style dinner of fried chicken and baked ham- with all of the homemade fixings, of course- to about 30 of their invited friends and guests as a trial run for Juniper Valley Ranch. Since then, untold thousands of visitors and locals alike have enjoyed the very same meal in the little mud house located about 15 miles south of Colorado Springs on Highway 115. The story of Juniper Valley Ranch, however, goes back much further than 1951. Guy Parker, the father of four girls, including Ethel and Evelyn, homesteaded at the turn of the century the land immediately west of the restaurant, and added surrounding parcels to the ranch over time. No stranger to the tourism business, the reputed second child born in Colorado Springs (1875) spent some of his early years guiding visitors via mule to the top of Pikes Peak. 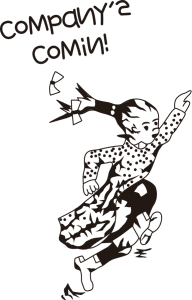 He also was a noted caller of square dances, and his expertise in America’s only folk dance was called upon to advise a high school troupe from Cheyenne Mountain that went on to gain national recognition. But Guy’s life’s work was in ranching. Shortly after becoming a “landed” man in the piñon and juniper covered hills south of Colorado Springs, he married Bessie Cross and they proceeded to forge a pioneering life on the ranch they named Mesa View. Bessie was no stranger to this lifestyle, herself being born in Fountain, educated in the one-room Lytle School and entered adulthood just north of Mesa View on her parent’s Turkey Creek Ranch. Her father, Frank Cross, later sold these arid grasslands to Spencer Penrose and they now serve as Fort Carson’s down-range recreational complex. After growing up working and riding on the range, the four Parker girls- Evelyn, Ethel, Elizabeth, and Lyla- began to marry and move on. In 1947, Evelyn and her husband, Walt, opened what was to be the precursor to Juniper Valley Ranch. 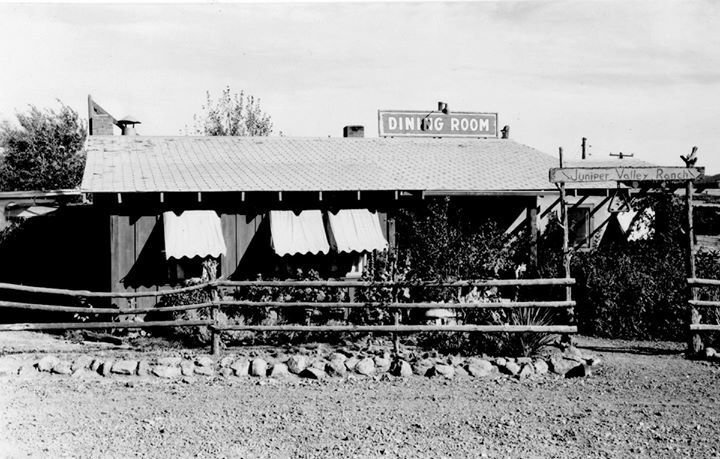 El Sombrero treated travelers along the newfangled dirt road connecting Colorado Springs and Cañon City- later to be paved and known as Highway 115- sandwiches, homemade ice cream, and other goodies. They also filled the café with the paintings, poems, and other works of art which were the lifelong passions of Guy and Evelyn. Guy built the initial restaurant structure out of adobe because of his love of the natural-looking architecture of northern New Mexico, a region he visited whenever possible. He liked to refer to Juniper Valley as the “gateway to the southwest”. In addition to the main dining room, he and his son-in-law built a bunkhouse, for Evelyn and Walt to live in, and other outbuildings, including a chicken house. Yes, in the early days, Juniper Valley raised its own chickens. (And that old chicken coop, slightly refurbished, has served as a family home for decades). Soon, Evelyn realized that she wanted to expand upon the café theme and create a full-fledged dining room, one which specialized in the down-home food that was typical of a special Sunday feast. Hence, Juniper Valley Ranch was born. The restaurant immediately became a family affair. Ethel and her husband, Matt Shirola, left a thriving restaurant career of their own in town and moved back out to the ranch. For the next 35 years or so, they worked alongside Evelyn day and night in creating a quality homemade meal in the comfortable atmosphere of the Old West. Ethel’s eldest grandson Greg Dickey took over in 1983 and has run the place ever since. His kids Olivia and Preston and wife Cindi play a big part in the day-to-day business. Many things have changed since 1951. But at Juniper Valley, the menu, the atmosphere, and the attitude that “you’re always company at our house”, have not.